Several years ago we lived on the gulf coast of Florida. I remember hunkering down in the living room while Hurricane Katrina raged outside. Despite the evacuation order issued for our neighbourhood, I was pregnant with Connor and couldn't bear to leave home. How the wind ripped the branches from the trees, the shingles from our roof, and the shutters from our windows (later found bobbing in the neighbour's pond)! The sound of the rain as it battered our house, the wind hurling things at us from every direction! Smash! - on the back of the house! Crash! - on the roof! Wham! - on the shuttered front window! Yet, amid the chaos and confusion the air tingled with the strange energy of life at its most real and raw. Is it wrong to compare the end of the school year to a hurricane? Probably, but that's how I've been feeling lately. The flood of activity, the tingling, electric sense of change that hovers in the air. When you have a food allergic child and all the school parties seem to revolve around food, it can feel as if you're being hit from every direction. A cupcake party one day, a popsicle party the next, summer birthday celebrations, field day. And then, late last week, there was a very special poetry tea. The kids had worked so hard throughout the year. Memorizing classics from Robert Lewis Stevenson, Aileen Fisher, Eloise Greenfield, HW Longfellow. This year Connor had a solo speaking part, and I didn't dare miss it! Knowing full well that a poetry tea means food, my mind was elsewhere as I rushed out the door without a safe treat for Eve. It hit me like a tidal wave as we walked into the classroom. I saw the look of longing in her eyes when she spied the long table in the back of the room. Decorated with a colourful table cloth, over flowing with trays of cookies, chocolates, and ice cream bars. There in the middle was a huge cake decorated with the class picture. And she knew that nothing was safe for her to eat. Or perhaps what I saw reflected in her eyes was the sudden, overwhelming feelings of shortcoming and failure on my part. How did I not think ahead and bring something safe for her? To make it up to her, I promised her an even better, safe cake when we got home, and her face was lit with a joyful grin knowing that she was in for a treat. "With orange frosting?" she asked (her favourite). "Covered in orange frosting!" I promised, "and you can lick the beaters!" Crisis averted. And that's exactly what I did as soon as we got home. 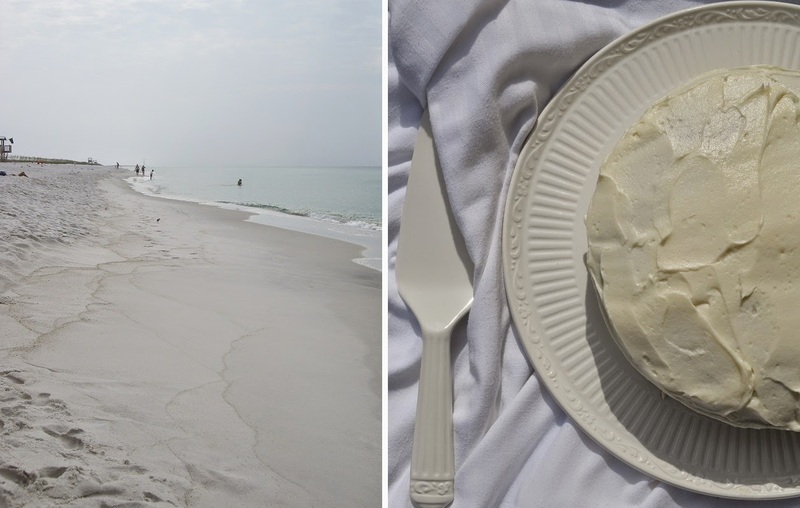 This cake reminds me of Florida on peaceful days. Of the sweet smell of oranges wafting from my neighbour's trees. Of the pure white sand on our favourite beach. Of the sunshine and the orange blossom honey from the farmer's market. I've been feeling a bit sentimental about it all lately - about the time when my boy was still little and we spent our days at the beach. Nothing like a cake inspired by Florida to ease the cravings of a little girl and to cure a case of nostalgia for me. Garnish it with fresh oranges if you like. Preheat your oven to 400 F (200 C). Trace the bottom of a 8-inch, round cake pan on a piece of parchment paper. Carefully cut out the circle just inside the line. Butter the pan well. Press the parchment into the bottom of the pan, and butter it well. Dust the inside of the pan with a few teaspoons of cake flour and set aside. Sift the flour, baking powder, and salt together into a large mixing bowl. With and electric mixer, slowly beat in the butter until just incorporated. Beat in the sugar and then the eggs, one at a time. Mix the vanilla, orange extract, and milk, and slowly beat this in until everything is just combined. Pour the batter into the prepared pan and bake for 28 - 30 minutes. Test for doneness with a toothpick or wooden skewer. Cool completely before removing from the pan and frosting. 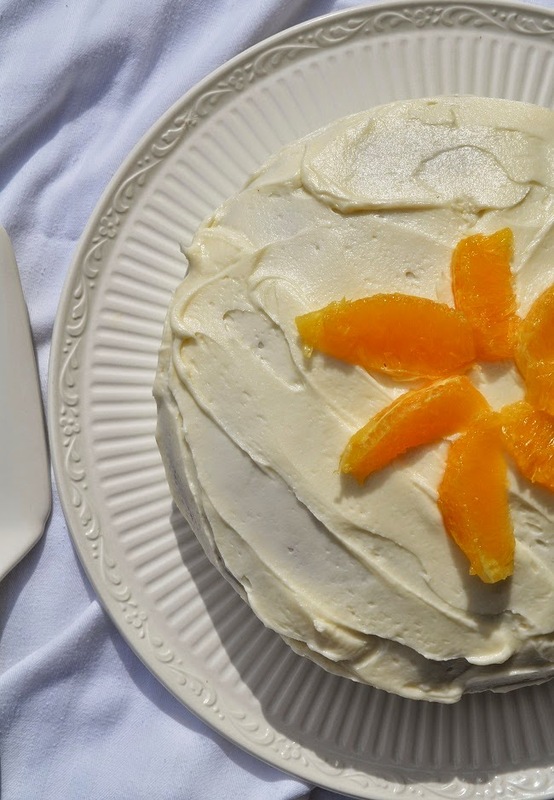 While the cake is cooling, whip up the orange-vanilla buttercream frosting (below). Beat together the butter and sugar until well combined. Add the cream, vanilla, orange extract, and salt. Beat again until light and fluffy. Remove the cake from the pan and place on a serving plate. 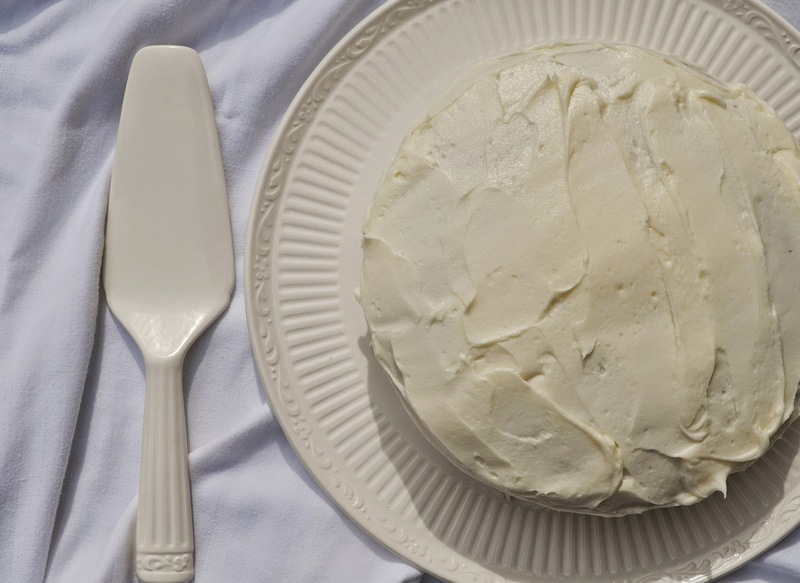 Spread a thin layer of frosting over the entire cake. (Don't worry about getting crumbs in this layer. This is the crumb coat, meant to catch all the crumbs and "glue" them to the cake so that your final layer of frosting is crumb-free.) Place the cake in the refrigerator for 15 - 20 minutes, until the crumb coat hardens. Spread the remaining frosting over the cake and refrigerate until firm. 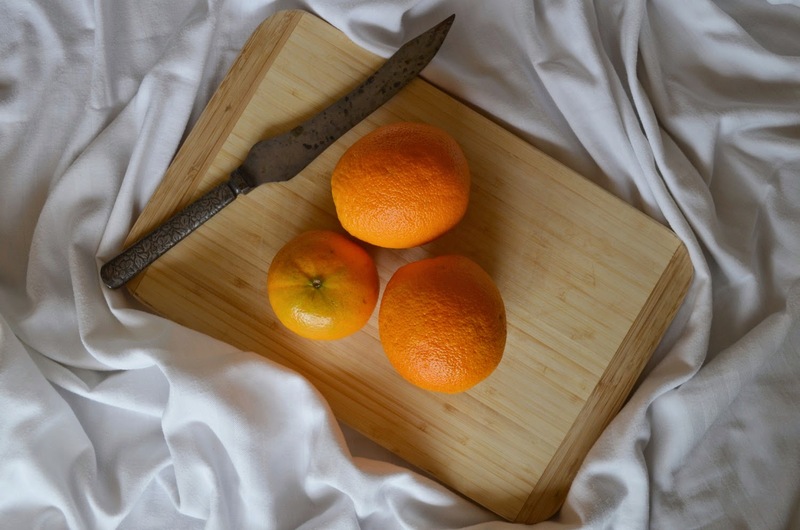 Garnish with fresh orange segment just before serving if desired. Was looking forward to making an orange cake. I was totally surprised though to see that it only used "orange extract" and no real orange. Even the picture showed real oranges...so sad.